Audoen was a pious man who was elected bishop of Rouen in 640 and died on the 24th of August 683. After his death many miracles were attributed to him. The Abbey Church of Rouen which was dedicated to him, housed the remains of most of the rulers of Normandy and also the heart of Richard the Lionheart. 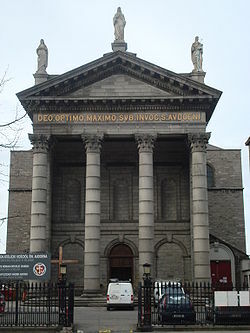 The date of the construction of St. Audoen’s Church in Dublin is not recorded but there is little doubt that it was founded by the Anglo-Normans and dedicated by them, to the patron saint of their original country. St.Audoen was not commemorated in the Celtic calendar of Saints, but was revered by the old French settlers of Dublin, many if whom bore Audoen as their surname. The Parish of St. Audoen was founded at the close of the 12th century and was one of the wealthiest in the city. The Prebendary of St. Audoen’s Parish received an annual pension of twenty pounds from the government, for visiting the sick in several prisons of the city. There was a cemetery on the western side of St. Audoen’s Arch which was the usual burial place for the prisoners who died in Newgate prison. The people of the area had a high veneration for a rough looking stone, which had a cross carved into it and was built into the wall at the base of the tower of St. Audoen’s Church. This stone referred to as the “Lucky Stone” was daily kissed and embraced by them, in the belief that it had the power to confer health and prosperity on those who visited it. The Lucky Stone was removed from St. Audoen’ s Arch and placed in front of the Catholic Church in High Street. It “disappeared” on several occasions throughout the history, being recovered from Glasnevin Cemetery, White Friar Street church (home to the relics of St Valentine). The most interesting story of the “Lucky Stone” was that it was found on a building site in Kilmainham in 1826. The watchman who kept vigil of the site during the night saw the stone glowing and taking human form. The next day when builders tried to smash the stone for material, it rocked and screamed violently before a harmer could touch it! It was returned to St Audoen’s after it was identified by its markings. This is not the only supernatural story to befall the Church either, the legendary Darkey Kelly is meant to still haunt the steps beside St Audeon’s. The tragic Dublin character is a famed for baring a son for the Sheriff of Dublin, in the mid 18th century. To avoid scandal (as she was a prostitute) he framed her for witchcraft and she was burned alive at St Stephen’s Green. The interesting part of the story is that it is now thought that Darkey was not so innocent and maybe Ireland’s first serial killer (read more a short story about her here). The Military Infirmary “for the cure of the sick and wounded of his majesty’s army” was held at St. Audoen’s Arch, in a house which, when the lease expired in 1730, was in such a bad state that a grant was made to erect a new hospital, for the same purpose in St. James’ Street. This was probably the humble beginnings of what would become St James’ Hospital. Delicious Recipes for Lamb Curry and Strawberry Mousse!